Three WJGA members, Kasey Maralack of Snoqualmie, Angela Zhang of Bellevue, and Maverick Stocker of Snohomish, are headed to Augusta National Golf Club to compete in the 2019 Drive, Chip and Putt Finals on Sunday, April 7th. Drive, Chip and Putt is an event that is put together between the Masters Tournament, the PGA of America and the USGA. The event is a free, nationwide youth golf development program open to boys and girls, ages 7-15. Drive, Chip & Putt will test the competitors in the skills essential to playing the game of golf – accuracy in driving, chipping and putting. Maralack will be making her third appearance at the Finals, also advancing to August the inaugural year in 2014, and then again in 2018 where she finished 2nd overall in the Girls 12-13 division. Both Zhang and Stocker will be making their first trip to Augusta, and all three players qualified via regional qualifying at Chambers Bay last year. Live TV coverage of the Drive, Chip and Putt National Finals will begin Sunday, April 7 at 5am PDT on the Golf Channel. The ANA Junior Inspiration and the American Junior Golf Association (AJGA) announced Brittany Kwon of Bremerton, Wash. as the 2019 Seattle Gateway City Qualifier. In her honor, ANA’s Gateway City Grant has made a financial contribution to support the Washington Junior Golf Association. The ANA Junior Inspiration, a partnership between the AJGA and All Nippon Airways (ANA) – Japan’s largest 5-star airline – will be held March 28-31, 2019, at Mission Hills Country Club in Rancho Mirage, Calif. Kwon, along with 47 other top-ranked junior girls from around the world, earned entry into the ANA Junior Inspiration, an official AJGA Invitational. Kwon recently won the 2018 Kyle Stanley Championship by Transamerica in Gig Harbor, Washington. She is also a three-time WJGA Junior Girls’ Player of the Year and the 2016 WJGA Girls’ overall state champion. Kwon was also named the 2018 Pacific Northwest Golf Association Junior Girls’ Player of the Year. This will be the junior’s first appearance at ANA Junior Inspiration. The winner of the ANA Junior Inspiration will receive an invitation for the final amateur exemption in the ANA Inspiration, the first LPGA major tournament of the year. Junior golfers, such as Kwon, qualified through the “ANA Priority Mileage” point system, which is based on the Rolex AJGA Rankings, with 11 spots given to the top qualifiers in ANA’s gateway cities of Chicago, Honolulu, Houston, Los Angeles, Mexico City, New York, San Francisco, San Jose, Seattle, Vancouver and Washington D.C. The field will be tested for 36 holes on the Pete Dye Challenge Course before playing the final round on the Dinah Shore Tournament Course with LPGA legends. During the final round, each pairings group will feature one LPGA legend and two juniors. Juniors will compete for the stroke play title and participate in a fun competition among pairings groups in a best-ball format with the legends. After qualifying as a representative of one of ANA’s gateway cities, each qualifier chose a local golf association in their area to receive a $5,000 grant from the ANA Junior Inspiration to support the growth and development of junior golf. Kwon selected the Washington Junior Golf Association. Since the Gateway City Grant program began in 2017, the ANA Junior Inspiration has donated $165,000 to local golf associations throughout the country. The ANA Inspiration is golf’s first major and one of the LPGA Tour’s most prestigious events. Previously known as the Kraft Nabisco Championship, the tournament was founded in 1972 by David Foster and Dinah Shore and earned the designation as a major championship in 1983. Contested at Mission Hills Country Club in Rancho Mirage, Calif., since its inception, the ANA Inspiration holds the distinction of being the second oldest golf tournament continuously held at the same course. For many, the event is most distinguished by one of golf’s most beloved traditions: the champion’s leap into Poppie’s Pond, located adjacent to the 18th green. In 1988, the first champion’s leap into Poppie’s Pond was taken by Amy Alcott, and since has become one of the most anticipated and memorable traditions in golf. For more information on the ANA Inspiration, please visit ANAinspiration.com or call 760-834-8872. Ian Siebers and Brittany Kwon have been voted as the Junior Boys’ and Girls’ Players of the Year by the Pacific Northwest Golf Association (PNGA). The PNGA Player of the Year candidates are nominated by the various state and provincial golf associations that comprise the PNGA (Alaska, Alberta, British Columbia, Idaho, Montana, Oregon and Washington), and are selected by a vote of the PNGA Championship Committee and members of the Northwest Golf Media Association. The awards are officially presented at the PNGA Annual Meeting in the spring. Those honored include Men’s Player of the Year, Chris Crisologo of Richmond, B.C. ; Women’s, Mary Parsons of Delta, B.C. ; Men’s Mid-Amateur, Reid Hatley of Hayden Lake, Idaho; Women’s Mid-Amateur, Gretchen Johnson of Portland, Ore.; Senior Men’s, Tom Brandes of Bellevue, Wash.; Senior Women’s, Lara Tennant of Portland, Ore.; Junior Boys’, Ian Siebers of Bellevue, Wash.; and Junior Girls’, Brittany Kwon of Bremerton, Wash.
Click here for a list of playing accomplishments of this year’s recipients, as well as a complete history of all past PNGA Player of the Year recipients. The PNGA was founded on February 4, 1899. It is a 501c3 charitable, international, amateur golf association dedicated to preserving the true spirit of golf by supporting its allied associations, conducting quality championships, and promoting activities beneficial to golfers in the Pacific Northwest. For more than a century, the Association has been a pioneer in developing competitions and services and its mission has grown and evolved. Today, the PNGA remains committed to being a truly regional organization providing benefits and services to its members and member clubs throughout the Northwest. The PGA Junior League team representing Bellingham-Skagit won the PGA Jr. League Regional Championship played at The Home Course in DuPont on Sept. 29-30. The win qualifies the team for the PGA Jr. League Championship Nov. 16-19 at Grayhawk Golf Club in Scottsdale, Arizona. The team trailed Utah by 1 1/2 points heading to Sunday’s final round, but a stellar final round gave Bellingham-Skagit a narrow 7-5 victory over the Utah PGA Section Champion. 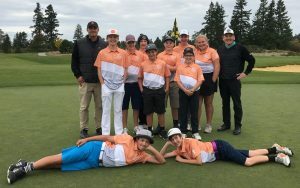 The Bellingham-Skagit All-Stars won the Pacific Northwest PGA Jr. League Section Championship Aug. 25-26 at Eagle Crest Golf Resort in Redmond, Oregon, to advance to the regional. The field of 81 PGA TOUR Champions players and 81 junior golfers is set for the 2018 PURE Insurance Championship Impacting The First Tee, taking place this week September 25-30 at Pebble Beach Golf Links and Poppy Hills Golf Course in Pebble Beach, Calif.
Three golfers from Washington, all members of WJGA, representing two different First Tee chapters have been selected to the field to compete in this year’s event. The PURE Insurance Championship is the only event of its kind in which 81 boys and girls from The First Tee are teamed with 81 PGA TOUR Champions players and 162 amateurs during an official PGA TOUR Champions tournament. In this 15th tournament year, more than 1,100 girls and boys from The First Tee have played in the tournament. Participants from The First Tee chapters, representing 22 states – including 17 players from Northern California – were selected by a national panel of judges based on playing ability and application of the Nine Core Values and life skills learned through their involvement with The First Tee’s programs: honesty, integrity, sportsmanship, respect, confidence, responsibility, perseverance, courtesy, and judgment. Junior competitor “alumni” include numerous boys and girls who have gone on to pro golf tour careers, including Harold Varner, Scott Langley, Cameron Champ, and Paula Creamer. All three rounds of competition in the PURE Insurance Championship will be televised on Golf Channel. For more information, please visit www.pureinsurancechampionship.com.